Gwen Stefani is partnering with OPI on a lacquer line! Stuart Weitzman x Kate Moss. Need I say more? 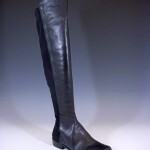 Over The Knee Boots: Pretty Fabulous or Pretty Woman?